The ancient world was filled with temples, wayside shrines, and altars almost everywhere you went. They could be as ornate as large buildings with marble halls, or as simple as a tree or pile of stacked stones. In our modern world, for many of us, that is a crucial part of our religion and spirituality that is missing. It creates a void that leaves us unfulfilled. But what purpose do they serve? Why do we as humans strive to carve out areas in our surroundings for our gods and spirits? Certainly they are all around us, but it provides a material and physical link to them, a way of reminding us of their presence, and most importantly, they provide a place where our prayers and devotion manifest and divine energy is shared. They take us out of the sphere of the mundane, and into the sphere of the sacred. Before we can know how to construct altars and shrines we need to go over their differences. What is an altar? An altar is generally regarded as a place where ritual and sacrifice takes place. It is where we do our spiritual work and witchcraft, and it is generally the center of our religious life. How does that differ from a shrine? Shrines are generally places of honor where smaller offerings are made such as libations, incense, flowers, and small food offerings. These sacred areas still retain the same power of divine communication and connection, but are more for the purpose of veneration than complex ritual or work. Shrines usually hold a secondary place in our religious life. Any surface can be an altar or shrine as long as it maintains the required space to carry out its function. You can use wooden or stone tables, shelves, or dressers. You are sacrificing this space as a sacred place for the divine so it shouldn’t be used for any other purpose. Ancestor veneration is a practice known worldwide. Appeasing those who have gone before us is integral to household cult. When the ancestors are happy, we are happy, and when they are not, we are not. Who are the ancestors? They are blood relatives, close family, and people who are a part of our family legacy through adoption or marriage. Non relatives shouldn’t be on your ancestor altar, we will get into where to honor them later. 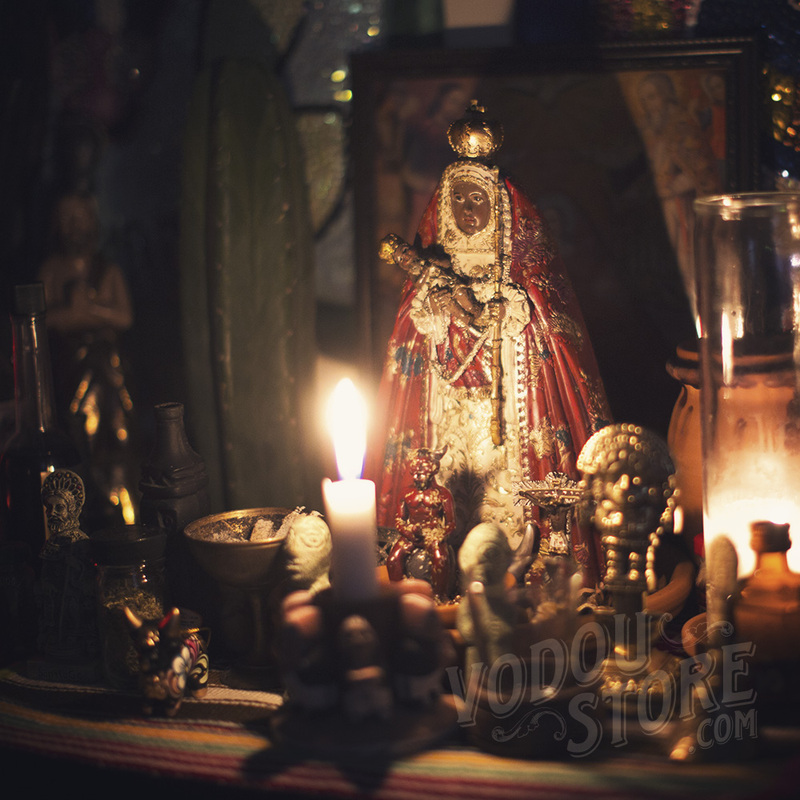 Depending on how you work, they can be housed on an altar or a shrine but there are some key items every ancestor altar should have. First, imagery. Photographs are by far the easiest and best representations of our ancestors we have access to today. Try to find photos of ancestors in their prime, typically late 20’s to early 30’s. If that is not possible you can use whatever you have access to, the important part being that no one living is in the photograph. The next option is a simple figure of a man and woman to represent your collective ancestors. This option is typically favored by those with limited space. An even simpler image can be a crucifix, a snake, or even a skull image. Let your feelings guide you as the ancestors often work through your instinct. if they don’t like something, they will let you know. Remember, the altar is dedicated to them, so it can include personal items of theirs, urns with ashes, pots of graveyard dirt, their favored saints (even if the practitioner isn’t a part of that religion), or even images of gods who may help with communication with ancestors. Next you will need a light. Typically a perpetual light is kept on the altar and can take the form of a candle, lamp, or even an electronic light. Electronic light has become a widely accepted advancement in religious life. We see shrines with electronic candles in India, China, Japan, throughout Europe in the Abrahamic faiths, and even in the religious practice of the Romani people where the use of televisions as perpetual lights has become popular. The perpetual element is key. It should never be extinguished with the exception of renewing the light source as it represents the immortality of the soul. If this means you feel more secure with an electronic candle over one with a flame, that is the option that should be chosen. Along with the light should be a glass of fresh spring water. This serves as a conduit to help the ancestors manifest their influence and can double as a divination tool for diviners. Next you will need offering dishes. One of the most common offerings is black coffee so a small coffee cup should be added. If you have a particular ancestor who liked their coffee a certain way, you can make it to their taste, but if it is a collective offering, black should be used. If your ancestor liked certain drinks or food, dishes to accommodate them should be added as well. Visit your ancestors daily, drink your morning coffee with them, and offer to them on important days such as birthdays and the anniversary of their death. Much like ancestor altars and shrines, hero altars and shrines adhere to the same principals and set ups although a lot more simplified, as such it is much more common to find hero shrines as opposed to altars. Who are heroes? They are any non blood individuals we wish to honor who we may or may not have a direct connection to, yet have influenced our life whether through friendship or inspiration. Not only can close friends who have passed be added, but public figures, authors, artists, those who have paved the way for us. Honoring heroes is a lot less involved as honoring ancestors so you do not need the perpetual light, but a candle or other light source should be added for when you visit the shrine. A small cup for libations and small dish for offerings can also be added if the practitioner chooses. Hero shrines are important to keep us motivated by those who inspire us but they are optional. Now that we have gone over ancestors and heroes, we can talk about the central figures of religious cult, gods and elevated or deified spirits. For many polytheists, the option of going down the street to the local temple of a patron god is pretty non existent. This simple fact makes household cult that much more important, and the need for a sacred space to act as a new temple. Traditionally, household cults involved no more than 6 gods. These gods were the gods of the family, the trade the family was involved in, or simply, gods they liked. Any other religious needs would be met at any number of civil temples or shrines. This lack of state religion leads the modern polytheist to fit that need in household cult and we can far exceed the limited 6 of our ancient ancestors. In our connected world we can honor gods from multiple pantheons, and while this is perfectly ok, their altars and shrines should be separately constructed and consecrated respecting the cultures they come from. In addition to gods, deified and elevated spirits have become popular. These range from saints, folk or otherwise, lwa, orisha, even angelic and demonic entities. Whether the practitioner serves gods or spirits, the general setup of their sacred spaces is very similar. First thing to consider is altar type. Are the gods or spirits heavenly or are they earthly? Heavenly beings prefer altars raised off the ground, so on a higher surface while earthly beings prefer to be close to the floor. Earthly beings typically guard gates and doorways, boundaries, forests, or are gods or spirits of the dead and the Underworld. Some gods and spirits function as both and can be placed on either raised or low to the ground altars or shrines. Now that we know the types of altars, who should we serve? Typically we serve gods or spirits who govern some aspect of our lives as our patrons. Of course that shouldn’t limit us in serving others, but we should choose not out of fashion, but out of reverence. Before we continue, be sure that you have a candle burning at all times during these next operations. This candle is then transferred to the altar as a sacred tool. The first item needed is the cult image. This can be a statue, picture, or even an object such as a stone, wooden planks, swords, spears, masks, or animal materials such as skulls or bones. Once you have an object of veneration, you should invite the god or spirit to inhabit it. This is done by reciting prayer or hymn while blessing and anointing the object with oils, holy water, fumigations of incense, and by lightly striking the statue with a cord. Some statues and cult objects will contain a prepared charge or amulet using herbs, stones, and other materials sacred or known to store the manna or numen of the deity it is dedicated to. In that way, our idols are our gods. They store their essence here in the physical world in our sacred spaces. Once you have your image properly consecrated it is time to install it on the altar or shrine. If the spirit or god has a particular symbol, sigil, or seal it can be inscribed and hidden under the cult image to further channel the entity. This part of the process should be done in secret, especially if these symbols are particular to your group, coven, or household. The altar itself should be freshly cleaned and anointed with oil, blessed with incense, or sprinkled with holy water beforehand, and the room or space it is in should be clean and neat. The sacred and anointed altar invites the god or spirit and should reflect that. Again, we find the candle or other light source on the altar or shrine. If the altar contains multiple gods or spirits, individual lights can be used, or one singular light if you prefer. This can be perpetual or lit as needed depending on preference. Along with the light you will want to have a cup or bowl for libations, a dish for food offerings, and an incense burner. You can adorn the altar as you see fit, appropriate to the god or spirit. The altar also acts as a kind of treasury. It is a place that houses heirlooms, offerings to the gods and spirits, and a place to store ritual items. One important ritual item is the bell. It is used at the start of prayer or ritual to call the deity into the space. This can also be a place to store vessels that can store spiritual energy. Several traditions use covered pots to store the mysteries of their spirits and gods. If you feel inclined to construct a sacred vessel, do so and house it within the altar. Another practice you may want to incorporate is the imbuement of numen in a travel idol. This can be a small statuette, a crystal or rock, icon, or any item you can use as a representation of your deities while you are away from your altar. it can be stored on the altar while at home and collected as needed. While we all want elaborate large altars for our gods and spirits, it may not always be within our means, and that is ok. The first and most common limitation is space. 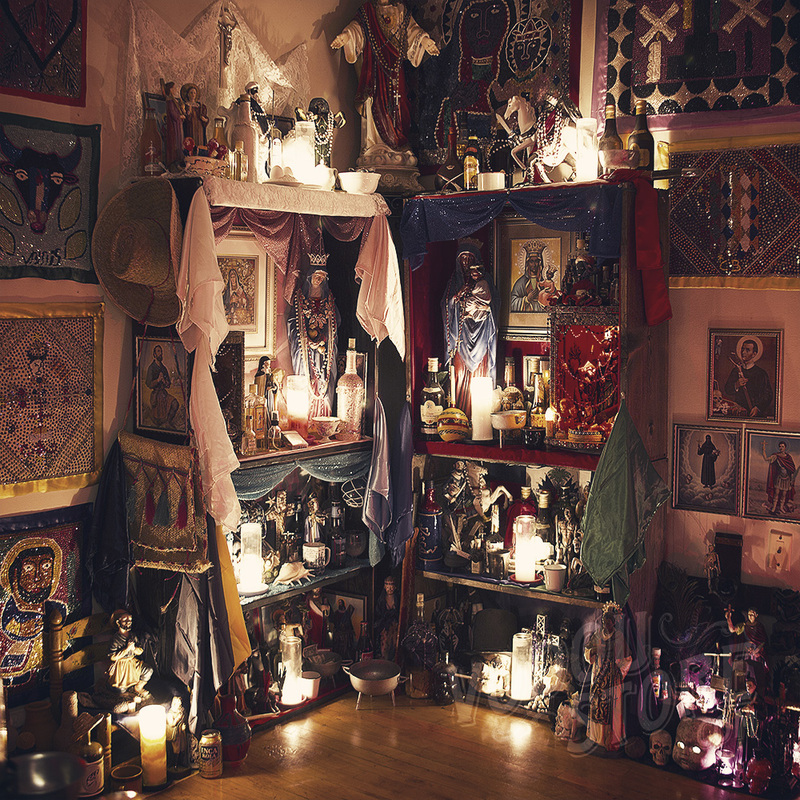 Altars and shrines require us to give up a certain amount of space to accommodate them. The good news is, the household altar or shrine can be as small as a wall shelf if need be, as well as any flat surface that is accessible for devotion. Let’s say worse case scenario you have absolutely no space to use as an altar. One simple work around is individual altar mats or tiles that can be kept in a cupboard or drawer. Consecrate the mat or tile to the god or spirit and bring it out as necessary. Some people have even used candy tins using miniature statues or prayer cards and birthday candles. The next common limitation is budget. Religious supplies can get very expensive and it is often this alone that prevents people from setting up altars. 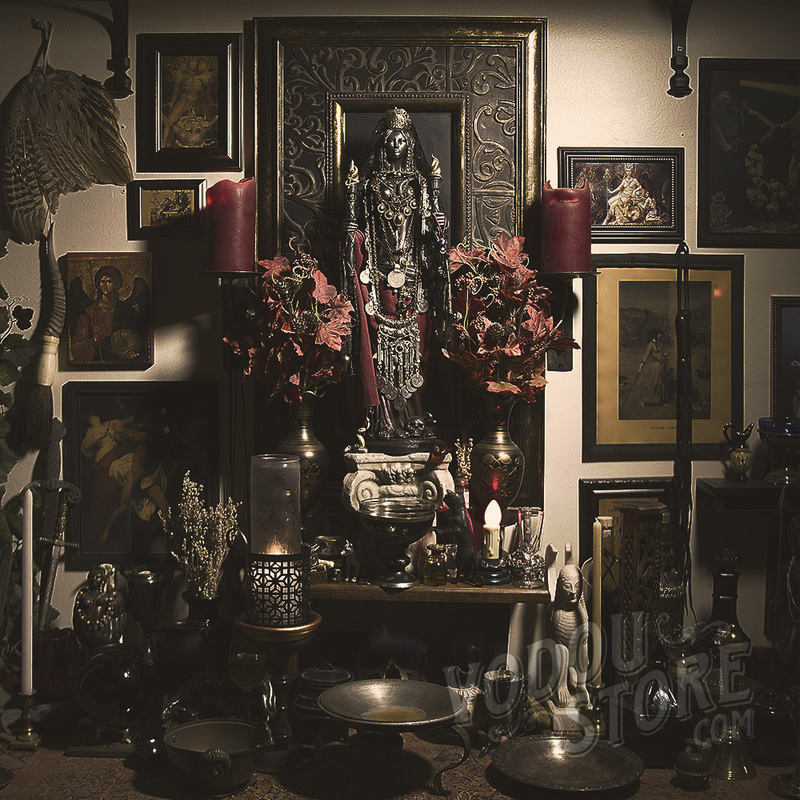 Everything you need to build an altar can be found around the home or in Nature. As mentioned before, a stone or plank of wood can be used as your cult image. In fact, these are among the earliest cult images known to man. You can go to the domain of your god or spirit, whether it be a crossroad, forest, river, cemetery, etc and collect a stone that calls to you, any size you choose. The same goes for a plank of wood. Try your hand at art or find an image online to print and glue to the wood. You can even use a varnish to seal the image for a more permanent and durable idol. You can also print and hang or frame images that call to you for your cult image. The most important part is finding something that feels right and allows you to commune with your divine. Bowls and cups don’t have to be fancy, and you can even use any spare dishware you have. Natural materials are best, but this is not required. Most of the items on our altars come from second hand stores, garage sales, eBay or Etsy, or flea markets so use these resources whenever you can. Offer your gods and spirits water, coffee, any extra food you may have from a meal, and flowers or other elements found in Nature around you. Worship and religion shouldn’t be a burden, but a life enhancer so work within your means. The last common limitation is fire and incense limitation. In our modern world fire is not a deal breaker. As mentioned before, electric light sources are perfectly acceptable and often ideal. This can be a lamp you set aside, electric tea lights, or even Christmas lights, as we see all across Central and South America and the Caribbean. For incense, you can simply use flowers, potpourri, or essential or fragrance oils and perfumes, all of which can be tailored to allergy sensitivity. 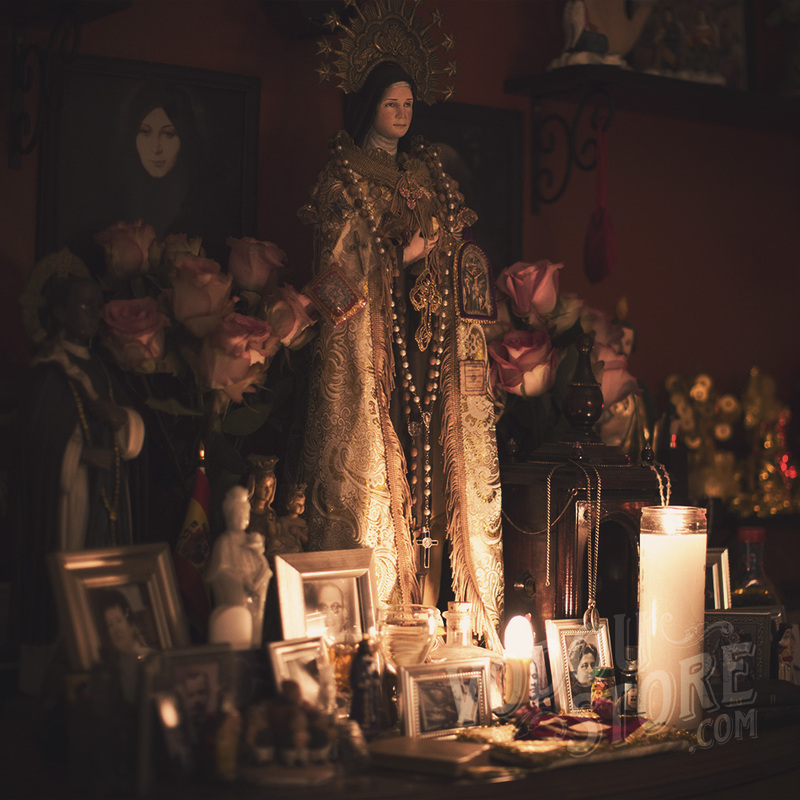 Altars and shrines greatly enhance our relationships with the divine. With careful planning, respect, and research, we can create sacred spaces that allow us to communicate with our gods and spirits in real and powerful ways. Be creative, have fun with it, and let your household cult evolve past any limitations! 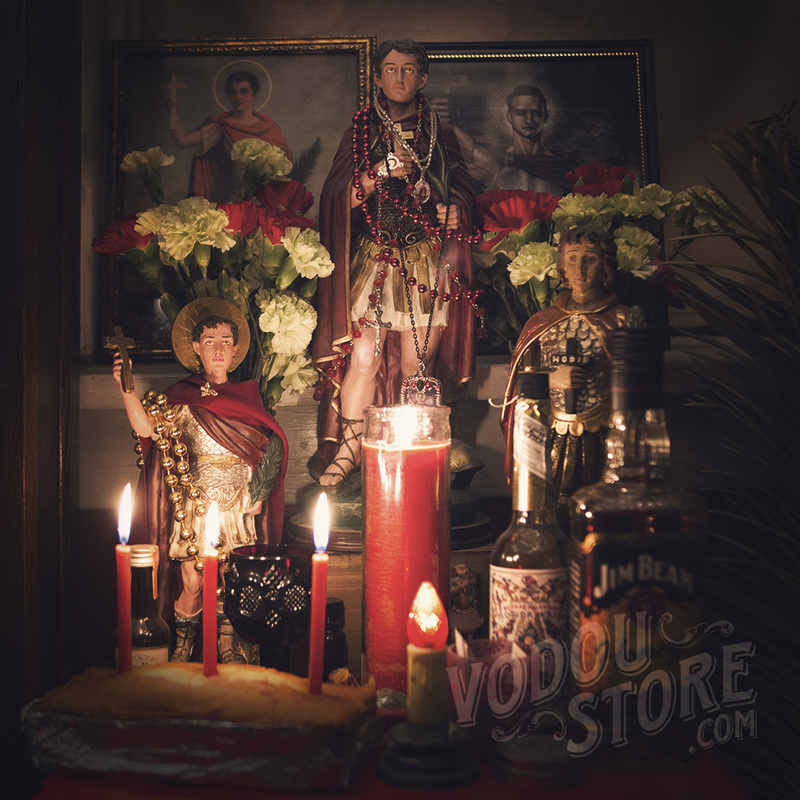 © The Vodou Store. All Rights Reserved.